This offer is no longer available. Thanks for your interest! Christmas is approaching quickly. During this time, kids request toys and games from their parents. And the parents, of course, buy them! The reason I’m creating this video is to let you know that my good friend Coolice has come up with something called Toy Store Clone. So, what is Toy Store Clone? Basically it’s a ready-made, WordPress Amazon store. Your visitors can go directly to the type of toys and games they want, with the click of a button. They can also look for toys by price. Toys that cost less than $25, all the way to $200+. And of course, they can find games according to age. From birth, all the way to 14 years old and up. If the visitor clicks the “Buy on Amazon” button, they will be taken to Amazon to buy the product. Amazon is a big and trusted name, and people don’t hesitate to buy from there. The post also has an add-to-cart button. If a visitor adds an Amazon product to their cart, the life of the Amazon affiliate cookie gets extended from 24 hours to 90 days. This means that, if your visitors buy anything within the next 90 days from Amazon, you will get credit for that. Each post also contains screenshots of the product, its features and the product’s description. In the footer of the site, there is a disclaimer that Amazon associates are required to have on their sites. The prices of the products are updated regularly when updates run on your website. This could be set up hourly, daily or weekly. And of course, you can use more plugins on the site, to extend it’s functionality. Including my own plugins. Click on the image on the left once and then click on the new image again to see it in full size. 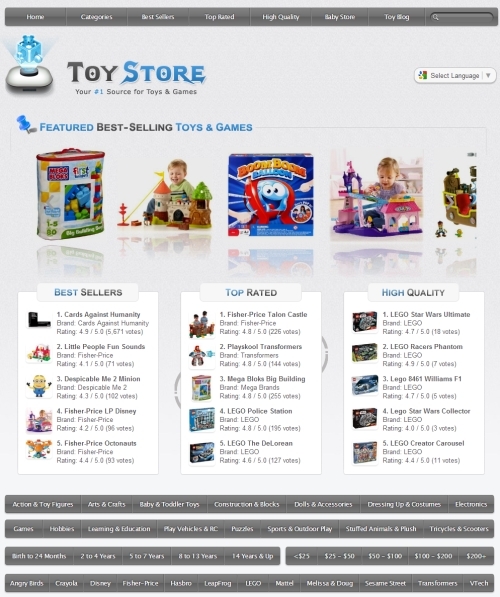 The regular single-site version of Toy Store Clone comes with 1,595 posts (products) in 19 categories and 12 brands. But for the demo site I set up, I used the unlimited, multi-site license which has more than 10 times the content. The unlimited license has 15,732 posts in 225 categories and 51 brands. And it took me less than 10 minutes to set up everything from start to finish. Also, If you are thinking of buying this business in a box, use the link on this page. Why? Because I will also send you an extra bonus of your choice. You can use it to make your Toy Store Clone site even more successful. Only 20 bonuses will be given. Current status: Available. STEP 1: Go to Toy Store Clone and purchase the package. Note: The price of the regular version will go up from $37 to $67 on December 22nd, 11:00 AM, EST. Btw, there are some bonuses that Coolice has made available to affiliates. These bonuses will help you promote your store and get traffic to it. Many affiliates will promise these bonuses to you, if you buy Toy Store Clone through their affiliate link. 1) Toy Store Clone isn’t just a WordPress “theme” or “plugin” – it’s an already-made WordPress Amazon toy store. You get to upload a zip file on your hosting account, and then you set up your site following an easy “wizard” interface. 2) This is a ready-made store that sells Toys and Games. It cannot be customized to promote products in other niches. 3) “Unlimited” and “multi-site” isn’t related to “WordPress multisite.” It just means that you can install Toy Store Clone on unlimited domains you own. 4) You need to have your own domain and hosting account. A domain will cost about $10/year. I use Namecheap.com. Hosting is $5-$10 per month (for probably unlimited sites). I use Hostgator.com. Coolice has a list of 100 domains that will work great in the “Toys & Games” niche, and, if you are quick, you can register one (or more) of them. That domain list basically gives you domain ideas. 6) The single-site license covers Amazon.com (US locale) only. The other locales are unlocked with the Unlimited version: (United States, United Kingdom, Canada, Spain, Germany, France, Italy, China, Japan). With that said, you can sell worldwide with both versions. The other locales are there to target other markets with products retrieved specifically from that Amazon locale website. However, Amazon.com ships worldwide anyway. 7) The unlimited license basically costs $104. But you can pay the $67 as an upgrade, after you pay the $37 for the normal license. So, the way to get the unlimited license is to invest $37+$67=$104 total. 8) As far as duplicate content goes: Unique content is always the best choice. Ready-made sites are a way to start in this niche for those who don’t want to write any content. 9) The posts are not drip-fed. They are all available right away. 10) Several guides are included with your purchase that show you how to promote your Toy Store Clone website. I live in the USRM (United Socialist Republic – MAINE). I am not eligible to participate in Amazon because our “government” doesn’t want me to make a living outside of our state….. Sorry for the rant. Nice product! Sorry to hear that, Brian! I hope the “rules” change in your area! Everything i see that Coolice designs is done with the intention of being complete…………Just jump in turn the key and drive…I like all his clone store designs. Yes, a lot of work goes into these sites! George you have some great plugins and recommendations! can we alter the ordering of any contents? 1. Ex. – Home page I like, but when go to Top Menu items – or Menu tabs below slider – the category pages display *all the menu tabs* BEFORE the images. >> Can we get the images/ slider to always show First, above the tabs?? individ. items from the Azon RSS [ API ] so they don’t appear? they are pulled-in to WP? 1. Yes, the slider can be enabled for all pages on the site and always show up on the top. 2. Yes, you can easily remove certain products, categories or brands that you don’t want to have on your website from the back-end. Hi George cool offer you have here…. My state won’t allow amazon affiliates . Is there another way to promote this ? thanks . Not one that I can think of, right now, Lee! It mean the unlimited version work with Amazon Germany also with german products ? Yes, ToyStoreClone Unlimited works with Amazon.de (Germany) and retrieves German products. The contents of the posts would be in German as well. can i also use the clon for other niche besides toys? is it possible to customize it later on? You said at point 6) The single-site license covers Amazon.com (US locale) only. The other locales are unlocked with the Unlimited version: (United States, United Kingdom, Canada, Spain, Germany, France, Italy, China, Japan). With that said, you can sell worldwide with both versions. The other locales are there to target other markets with products retrieved specifically from that Amazon locale website. However, Amazon.com ships worldwide anyway. But if i use the plugin ‘Amazon Affiliate Link Localizer’ where i put my affiliate IDs of the other countries of Amazon, doesn’t it redirect to the other Amazon countries? I haven’t tried the plugin you mention to be honest. If you have used it in the past and it’s reliable, then it should work with Toy Store Clone as well. I’m no coder and was wondering if there are video tutorials to teach how to setup. Also I was not aware that this was a plugin for WordPress. If you contact Coolice, he will set up everything for you for free. Thanks for info, but where can I get the PDF Guide? Please disregard the previous question. Once I thought ToyStore was a plugin I didn’t bother to look for any instructions for upload. I use Godaddy for hosting my sites and I have a primary site hosted with other sites hosted under it. I guess I would just upload both files: importbuddy.php and back up file into my root folder of the site I plan to use. Do I need to use an ftp client or can I just go into my file manager within my control panel. You can do it either with FTP or cPanel file manager. Or, you can just ask Coolice to set it up for you. Free installation is included. I am wondering if the title “ToyStoreClone” that shows next to the logo can be changed to the domain name? Or are all these stores that are being set up with this theme going to say “ToyStoreClone” ? … and then added my name to it (with a free graphic-editing software like Paint.net), uploaded it to the same location and replaced the old image with the new one. Thank you, George. I clicked on the link you provided and the image has not changed to George’s Toy Store. So, I’m not sure why. It still says “Toy Store”. Can you try again, Barbara? Thanks, George. At first when I tried again, nothing had changed. So, I cleared my cache and now I can see “George’s Toy Store”. Thanks for the help. Barbara’s correct the link you provided does not take us to George’s Toy Store. Can you please check again? I’m positive that the logo says “George’s Toy Store.” Maybe you need to clear your browser’s cache? I was also wondering if the content provided is copyrighted, including the videos. Can we use these freely, or are they protected? I don’t want to get into trouble. The content come from the Amazon API, which is allowed. The videos are just Youtube videos that are embedded in the posts. I looked at your demo site and see you have a blog also. Is that built into the Toy Store clone package? The blog is mine. I just installed Toy Store Clone in a directory of my site (toy-store-clone-site). I also noticed that when you click the Customer Reviews button it redirects to the Amazon page for the reviews. If they order the product by going to Amazon reviews page, do I get the commisions for the sale? How did you get your blog at http://www.georgekatsoudas.com/toy-store-clone-site/toy-blog/ to look just like the amazon toy store? Toy Store Clone looks like this out of the box. It comes with two themes: a black one and a “silver” (gray) one. Because when I use cron job the price still shows same date as above. The point of the cron job is to do exactly that: Update the post automatically. You can set the cron job to run daily, weekly etc. Please allow a little time for the cron job to run, the very first time you set it up in cpanel. I just purchased ToyStoreClone – Unlimited Version. How do I get Coolice to set it up? Don’t forget to email me for your bonus as well! can i add products in other niches at the unlimited oto version ?